The purpose of the Aging with Vision Loss (AVL) program is to assist older persons, who are legally or totally blind to maintain or regain the highest degree of independence possible. Paul Brennan is the AVL Independent Living Services (ILS) Instructor for the north/central portion of Orange County; Jeanne Bray is the Independent Living Services Instructor for the southern region of the county; and Michelle Ramos covers the extreme eastern area of Los Angeles County. The AVL staff believes that being a part of the transformation that takes place when a consumer is able to tell time, access household appliances and travel to appointments independently is, in a word, miraculous. Individuals, who are fifty-five years of age or older, have a significant vision loss, and reside in either Orange County or Los Angeles County, are eligible to receive services through the Aging with Vision Loss program. 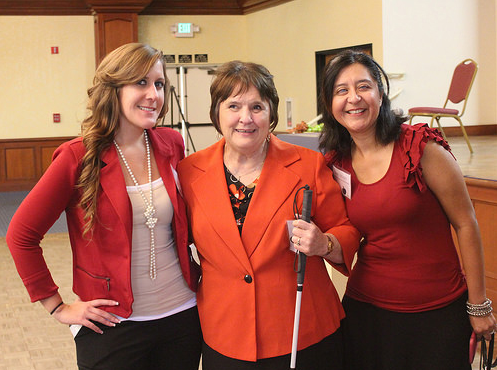 For more information about the Aging with Vision Loss program call 714.621.3300 or complete the online form. Potential consumers are referred to the Aging with Vision Loss program by a variety of sources such as case managers from senior centers and community-based organizations, diabetic educators, hospital discharge planners, medical personnel, and by word-of-mouth. Individuals may also be self-referred. 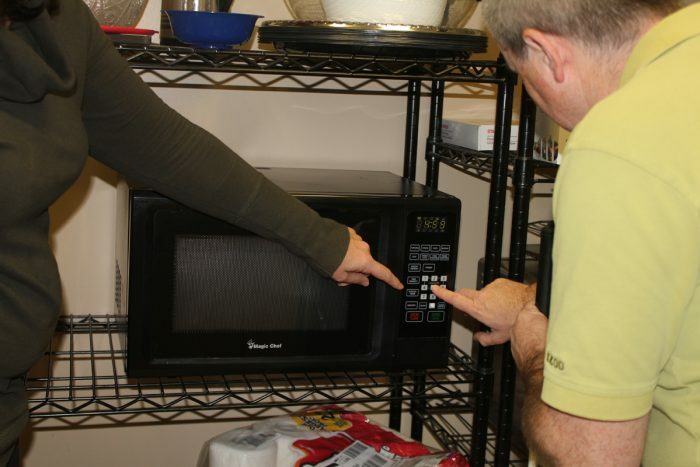 Tactile markings can be placed on household appliances to provide a specific point of reference for persons with vision loss. The Independent Living Services Instructor completes the intake form with the consumer, which includes demographic information such as name, address, telephone number, date of birth, cause of vision loss, etc. An independent living skills questionnaire is then administered to identify needed services, priorities, and levels of functioning. The results of the survey help to structure delivery of services. The purpose and content of an independent living plan is explained and the instructor and consumer work together to develop the plan, which includes goals, related tasks to be accomplished, target dates, and desired outcomes. Independent living services through the AVL program are provided most frequently at the homes of consumers. This approach is preferred for several reasons. Older consumers tend to be more responsive and less anxious in familiar surroundings. Assistance can be structured to fit the individual resources and lifestyle of each individual. Others significant to the consumer are more likely to become involved and aid the consumer to adjust to blindness. Services can also be provided at either of the center’s offices and at other designated sites in the community. Occasionally, training and demonstrations are conducted in small group settings. Services available to AVL consumers are as follows. Adjustment Counseling: Coordination of individual and group support for consumers and significant others as they strive to understand and adapt to blindness including defining feelings attitudes and values which may impact the attainment of personal goals, being able to accurately assess one’s strengths and limitations, and regaining a sense of pride and self-worth. 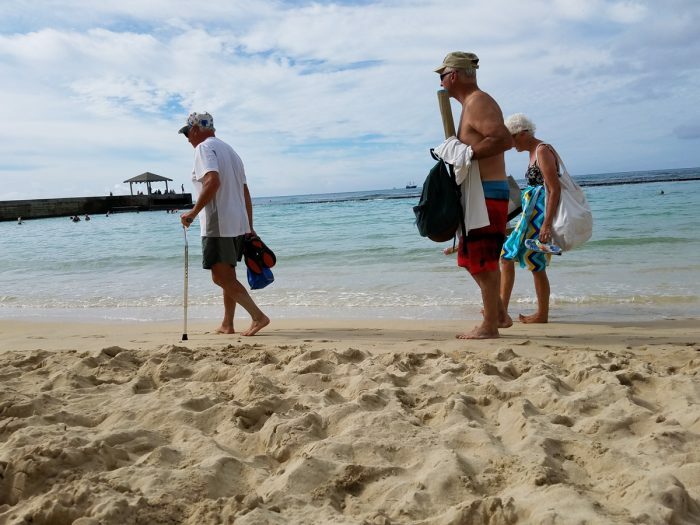 Basic Orientation: Demonstration of techniques used to maintain familiarization with one’s immediate environment whether in the home, neighborhood, or community; explanation of cane travel, walking with sighted guides, and obtaining and using guide dogs. Communication Assistance: If feasible, basic training in reading and writing Braille, adaptive methods of hand writing, typing, and use of communication devices such as the telephone, digital recorders, smart phones, and computers. Information and Referral: Assistance in the location of resources and information relevant to products and services for older individuals with significant vision loss, as well as, referral for services such as low vision assessments or orientation and mobility training. Independent Living Skills Training: Instruction in adaptive techniques for grooming and personal care; housekeeping tasks; meal planning, cooking, and shopping; budgeting, coin recognition, and use of specially designed wallets and change purses, check-writing guides, raised-line checks, and automatic and on-line banking services. Introduction to Assistive Technology (AT): Provision of basic devices to enhance independent living and instruction on how to use these devices; identification of more complex AT, which might be useful to the consumer, as well as, sources for the acquisition of adaptive technology and training. Self-Advocacy: Training toward the development of skills for sound decision-making, problem-solving, assessment of potential risks and consequences, and mediation to acquire and/or preserve benefits and services. Transportation: Instruction regarding the use of available modes of transportation such as fixed bus routes and the dial-a-ride system; and, if desired, assistance to complete the Access para-transit services application. 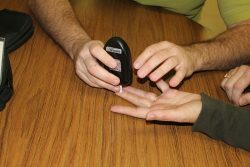 Services in the Aging with Vision Loss program continue until the desired outcomes have been reached; the consumer fails to participate over a specified period of time; the consumer voluntarily withdraws from the program; the individual relocates out of the service area; or the person dies. Following case closure, consumers have the opportunity to complete a satisfaction survey in order to express their opinions of the effectiveness of the program.